Product Goal Options are settings that are utilized in tandem with your Legacy Product Management set up. There are 2 main options for setting goals using Legacy Product Management. OPTION #1: Dynamic Text Matching. Basically what this refers to is having our script take a look at the entire page content further down in the sequence of your funnel steps (often a Thank You or Order Confirmation Page but not always). Our scripts will look to see if your confirmation or thank you page CONTAINS the EXACT text that you have typed into the Option #1 Form field. You want to select a product in the dropdown that you would like associated with this dynamic text so that our script knows what sale should be logged. OPTION #2: Decline URL option. 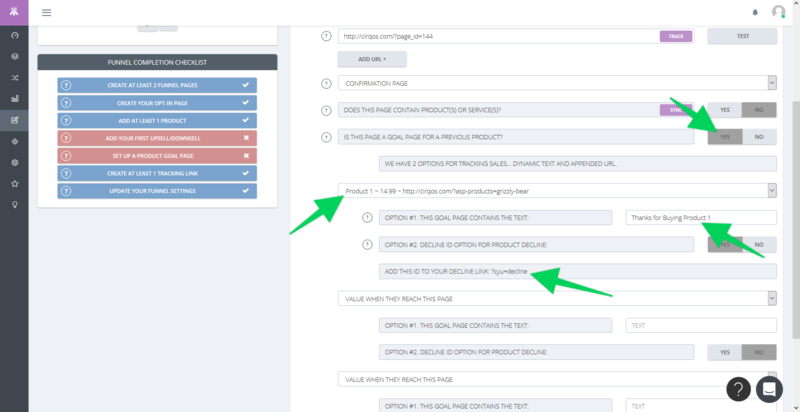 This is an option you can use if you’d like us to log a sale regardless of the text that is contained on a goal page (basically anytime they reach this page it will be a result of buying a product.) The only exceptions will be if they are linked to the page from the PRIOR URL with an appendage like ?cyu=decline attached to your link URL. Our scripts will automatically detect this and NOT LOG a sale if it sees this appendage in that link.